At a fraction of the price, Exclusiv Vodka outscored Absolut, Chopin, Smirnoff and other major brands at the 2012 San Francisco World Spirits Competition. The Double Gold medal winners in the 2012 San Francisco World Spirits Competition prove that spending more money for a bottle of Vodka doesn’t guarantee better taste. In a surprising upset, Vodka newcomer, Exclusiv Vodka, beat out several major brands including Absolut, Chopin, Smirnoff, Finlandia, and others and costs a fraction of the price. Exclusiv Vodka stood up to more than 1,200 spirits being judged this year—the largest group of entries in the 12-year history of the competition. The San Francisco competition is the oldest, largest, and most recognized spirits competition in the United States. Earlier this year, Exclusiv Vodka set the precedence for quality, affordable spirits when the $10 bottle of Vodka scored 91 out of 100 points in the 2012 Tastings.com reviews from the Beverage Tasting Institute, beating Finlandia and Skyy (each 88 points) and tying Chopin and Svedka. 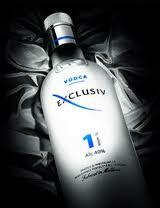 Exclusiv Vodka was also the “2011 Best Value Vodka $10 and Under” winner. Exclusiv Vodka is made in Moldova, a country known for producing some of the finest spirits Eastern Europe has to offer, and imported to the US by Serge Chistov of Serge Imports, LLC. Exclusiv Vodka sells for about $9.99 for a 750 mL bottle, rivaling the likes of Chopin, $29.99 per bottle, Absolut, $50.00 per bottle and Skyy, $20.00 per bottle. Exclusiv Vodka is imported through Serge Imports, LLC and is available in NY, NJ, CT, FL, MD, DC, SC and GA through the Charmer Sunbelt Group (CSG), one of the nation’s leading distributors of fine wines, spirits, beer and other beverages. CSG operates local distributor and/or brokerage houses in 15 markets – Alabama, Arizona, Colorado, Connecticut, Delaware, Florida, Maryland, Mississippi, New Jersey, New York (Metro and Upstate), Pennsylvania, South Carolina, Virginia, and The District of Columbia.